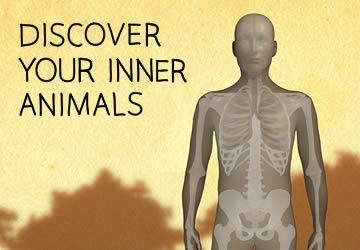 Click on a human body part to meet your inner animals. The ability to see the world in color is one most people take for granted. But our earliest primate ancestors lacked this ability. When and how did we gain the ability to see the world the way we do? Neil Shubin pays a visit to vision expert Jay Neitz to learn where our color vision comes from. Even though eyeballs don't generally fossilize, the eye sockets, also called orbits, reveal a lot about an animal's eyes. 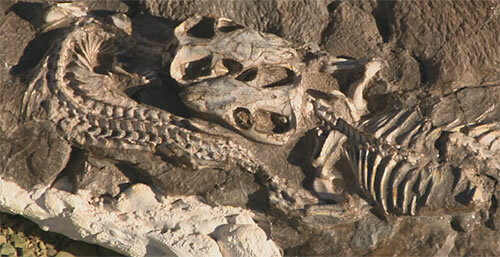 Evolutionary inferences can be drawn from comparing the position of the orbits among various fossilized skulls. Some 375 million years ago, our fishy ancestors living in the shallows had eyes near the top of their skulls. This allowed them to look at what lay above the water's surface without exposing their entire bodies. 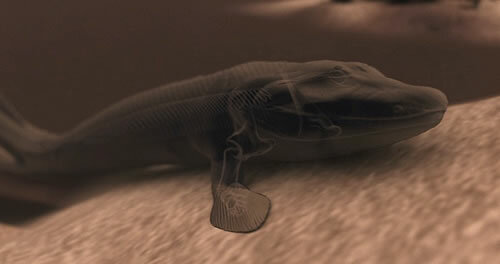 You can see this location of the eyes in animals like Tiktaalik. As our lineage moved onto land, our ancestors' eyes migrated toward the sides of the head. This adaptation of their visual ability gave them a better view of the landscape, whether they were hunting for prey or looking out for predators. 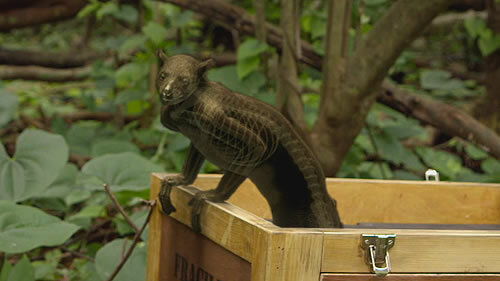 Fossils of animals like Thrinaxodon, for example, have orbits near the sides of their heads. Finally, in our primate ancestors, the eyes moved to the front of the skull. 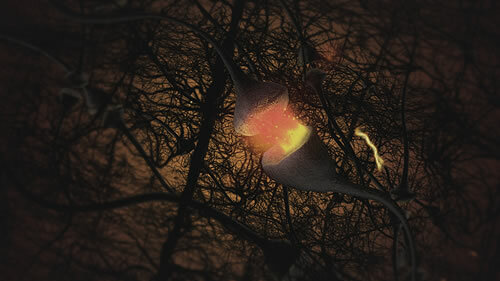 This resulted in better depth perception, a critical capability in animals who spend their lives leaping among branches. Fossils of early primates like Notharctus exhibit this type of eye-socket placement. You may not think there's much insight to be gleaned from a tooth, but paleontologist Neil Shubin shows us that's not the case. As he demonstrates with a collection of skeletons, teeth contain an incredible amount of information about how an animal lives its life. Although teeth look very different from hair, nails or sweat glands, teeth share a deep evolutionary history with these and other parts of our anatomy. 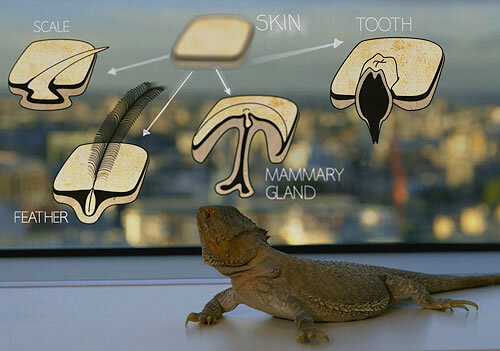 The shared origin of these body parts is reflected in their strikingly similar development. They also share a common set of genetic instructions, including the master regulator gene EDA. EDA also controls the development of skin features in many other animals, including fish, suggesting that these features' history is ancient. 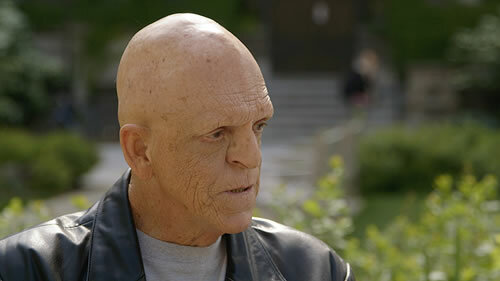 In fact, people who inherit a damaged EDA gene can develop ectodermal dysplasias, a set of conditions in which teeth, hair, nails and sweat glands do not form properly. Unlike most other primates, apes don't have a tail. When did our ancestors lose this potentially useful appendage? Paleoanthropologist Holly Dunsworth introduces Neil Shubin to Proconsul, a fossil ape that provides some answers to that question. The shape of our backs keeps us balanced when we walk on two legs, but the benefit of bipedalism comes at a cost. Anatomist Bruce Latimer shows how our transition to being exclusively bipedal has led to many common back ailments. Our brain enables us to do some amazing things, so it's not surprising that its evolutionary story runs deep. Biologists Peter Holland and Neil Shubin go hunting for amphioxus, a tiny, wormlike animal, whose genes show us the ancient roots of our brain. While the human brain is exceptional in many ways, the truth is that it has some striking similarities with the brains of many other animals, including fish. Anatomist Neil Shubin dissects a fish brain and a human brain and shows us how much we have in common with our sea-dwelling cousins. 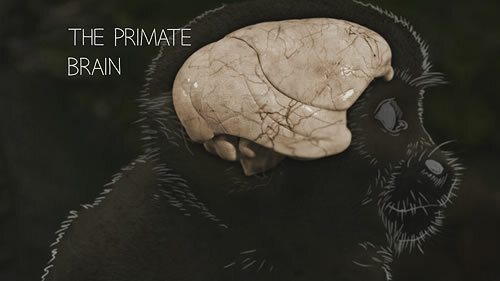 In overall form and organization, our brains are amazingly similar to those of other primates. For example, large areas of the brain of all primates are devoted to processing visual information. All primate brains, including those of humans, also contain specialized functional regions — for example, an area that's involved in controlling how we grasp and manipulate objects. These aspects of the brain are critical to characteristic human behaviors, including the capacity to make tools. Given strong similarities among all primate brains, the larger number of neurons in our brain and particular connections among various regions of our brain likely account for exceptional human capabilities. When did we start walking exclusively on two legs, and how did this transition take place? 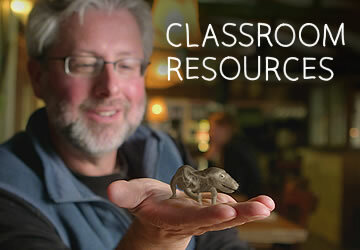 Neil Shubin pays a visit to Tim White and Owen Lovejoy, two anthropologists working together to understand "Ardi," a 4.4-million-year-old fossil that sheds light on our transition to bipedalism. 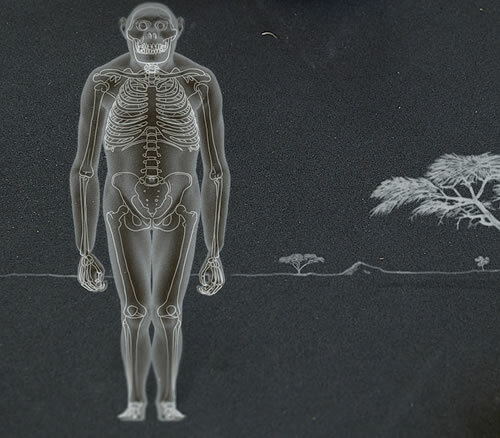 Our ancestors didn't just stand up and start walking. Moving efficiently using only two legs has resulted from numerous adaptations, some obvious and some subtler. It's hard to discern, but human legs are angled inward from pelvis to knee, helping us to balance and to walk efficiently. This evolutionary shift is evident in the 3.2-million-year-old hominid fossil named "Lucy." Without this subtle change, our walk would look more like a chimp's, with a distinct off-balance waddle. Our hand has the same basic form as the hands of all other primates. But what did the earliest version of this hand look like? Neil Shubin pays a visit to Jon Bloch, who shows him a remarkable fossil of Notharctus, an early primate with a hand that you may recognize. 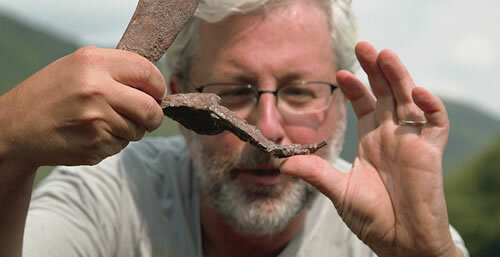 After searching for some of the first stone tools made by our ancestors, Neil Shubin pays a visit to paleoanthropologist Tracy Kivell, who shows him how changes in the hands of our ancestors led to the ability to create and use tools. Although the human hand enables many of our unique capabilities, its underlying structure is evident in fossilized remains that are hundreds of millions of years old. Animals like Tiktaalik and Acanthostega, which lived their life at the water's edge, had the anatomical underpinnings of a hand — with wrist elements and eight digits. Descendants of those transitional animals lost some of their digits in the course of evolution, leaving humans with the five-fingered hands we have today. 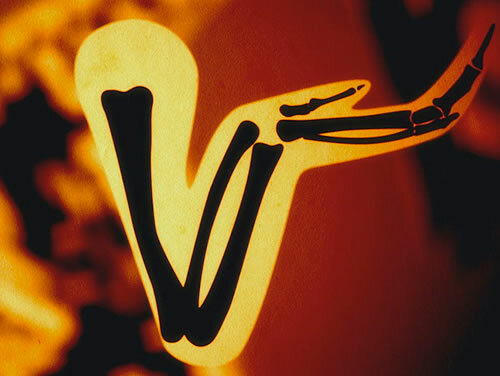 Our hands result from genetic recipes that have been altered and passed down for over 375 million years. The basic instructions are shared by all four-limbed vertebrates, known as tetrapods, which inherited these genes from a common ancestor, represented by transitional fish like Tiktaalik. This means some of the genes that fashion human hands are the same as the genes that shape a chicken's wings or a fish's fins.